Ocean Spray is a well known shrub west of the Cascades. It occupies dry woods in part shade to full sun. 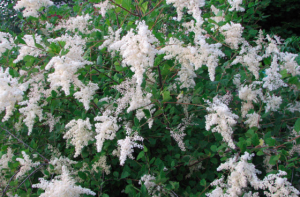 Large and spreading it displays foamy white clusters of flowers in early summer. They age to a tan color before falling apart. Handsome small scalloped leaves are very pretty and turn yellow to orange in autumn. To 9′ x 7′ very quickly in virtually any soil type. Extremely drought adapted when established- but amenable to light irrigation in summer. Wild look for wild areas, match with native perennials. Often suckers to form patches and it is common for seedlings to show up around the parent plant. These can be moved when young or dispatched. Birds adore the dried seeds in winter. Pretty native in the Rose family. Moderate deer resistance- but sometimes they attack it if it is newly planted so protect. Winter deciduous. Oregon native plant.